The sophistication and diversity of outdoor kitchens and fireplaces has grown significantly over the past few decades. The Clearwater team specializes in designing and installing custom outdoor kitchens of all sizes, configurations, and materials. 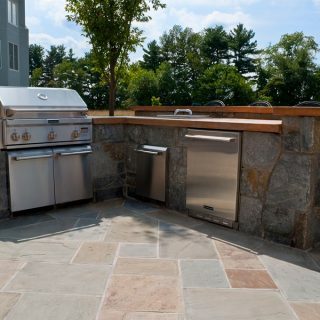 With outdoor kitchens, we can integrate a grill, sink, oven, refrigerator, and many other appliances directly into your hardscape, making outdoor entertaining easier and more stylish than ever. Plus, our award-winning design and installation capabilities enable us to deliver a kitchen that’s a cohesive part of your outdoor-living space, so you may never cook indoors again! The beauty of adding an outdoor kitchen to your complete custom hardscape is that we can create any configuration and layout imaginable. From simple grill islands to large angled or curved outdoor kitchens with bar seating and beyond, the sky’s the limit. We can even integrate a custom pergola or pavilion roof to shield you from sun and rain, and added fire features like an outdoor fireplace can allow outdoor cooking even when the weather turns cold. Whether you know exactly what you want in your dream outdoor kitchen or would prefer our design experts to get creative and surprise you, we’re your ideal outdoor kitchen partner. 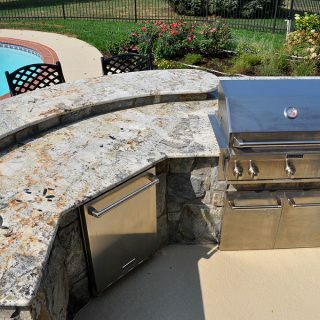 When you choose Clearwater to handle the design and installation of your new outdoor kitchen, we’ll assist you in the selection of your premium-quality appliances. Options include built-in grills and side burners, ovens and pizza ovens, smoker cabinets, cooktops, storage cabinets and drawers, outdoor refrigerators and icemakers, sinks, bar centers, vent hoods, warming drawers, wine coolers, accessories, and more. We have experience sourcing, assembling, and installing outdoor kitchen appliances from all major leading brands, such as Capital, Cal Flame, Viking, Kalamazoo, and many others. Clearwater offers a myriad of material options for our outdoor kitchens and integrated hardscapes. We’ll help you choose from our broad array of available brick, natural and engineered stone, tile, concrete pavers, and other materials. 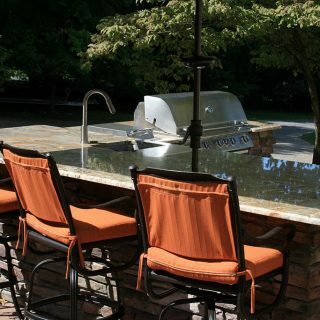 We also offer a range of outdoor kitchen countertop materials, including granite, marble, and engineered options. We can even coordinate your materials to match or compliment your home’s brick or stonework, depending on your goals and your vision. Are you interested in learning more about our capabilities and your options for custom outdoor kitchens? Just click below to visit our outdoor kitchen gallery to see examples of our diverse experience and broad expertise in outdoor kitchens.